CEO Alan Mulally: Among 18 executives being named to council. 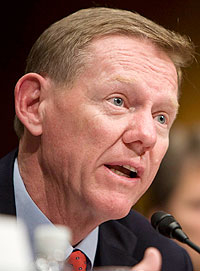 WASHINGTON (Bloomberg) -- Ford Motor Co. CEO Alan Mulally is among 18 executives President Barack Obama named today to an advisory group on increasing U.S. exports. “Boosting America's exports strengthens our economic growth and supports millions of good, high-paying American jobs,” Obama said in a statement. Obama created the Export Council earlier this year and laid out a goal of doubling U.S. exports during the next five years. Agriculture Secretary Tom Vilsack said yesterday that agricultural exports increased 19 percent during this year's first quarter. “President Obama recently set a national goal of doubling U.S. exports over the next five years," Mulally said in a statement. "We applaud this forward-looking goal and I am honored to serve on the President's Export Council and work toward helping America achieve it." The president spoke today about progress on increasing U.S. exports, highlighting 18 trade missions coordinated by the Department of Commerce, loans from the U.S. Export-Import Bank that have helped support almost 110,000 jobs, and new agreements on exports of U.S. agricultural products. Obama named members of the export council to join Boeing Co. CEO James McNerney and Xerox Corp. CEO Ursula Burns, who were picked in March to lead the group. Appointees to the council, the White House said, include: Walt Disney Co. CEO Robert Iger; United Parcel Service Inc. CEO Scott Davis; MetLife Inc. CEO Robert Henrikson; Pfizer Inc. CEO Jeffrey Kindler; Verizon Communications Inc. CEO Ivan Seidenberg; Archer Daniels Midland Co. CEO Patricia Woertz; and UAL Corp. CEO Glenn Tilton. Council members also include: Vermeer Corp. CEO Mary Andringa; Dow Chemical Co. CEO Andrew Liveris; Dow Corning Corp. CEO Stephanie Burns; Warburg Pincus LLC Co-President Charles Kaye; Ernst & Young LLP CEO James Turley; and Carpenter & Co. CEO Richard Friedman. Other appointees are: G&C Equipment Corp. President Glen Hale; United Association General President William Hite; former Greater Construction Corp. CEO Robert Mandell; and Magno International LP President Raul Pedraza.